Jan Weatherhead writes from Washington: So, the good folk in Afghanistan are our newest best friends. 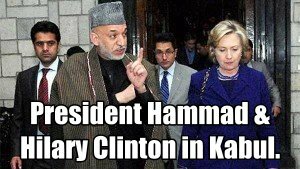 Hamid Karzai and Hilary Clinton met up this week in Afghanistan, you maybe interested in what they were both wearing. You might be interested more about what they spoke about. Your probably more interested in how the two made friends. Perhaps there will be a MeetUp in Washington soon too. Find out a lot more about Meet Ups in Afghanistan, President Hamid Karzai; what Hilary Clinton‘s projected plans are for the next four years and beyond. America has a new best friend. Believe it or not it is Afghanistan. That takes some believing.